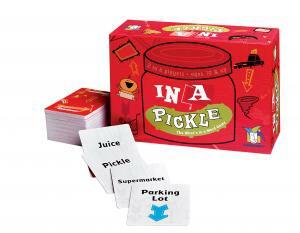 We love games like In a Pickle that get the creative juices flowing. This is a great game to break out when you need to stretch your brain. See how outrageous you can get with the scenarios you create. At the same time, challenge yourself (and your opponents) to think outside the norm and picture scenes that might otherwise seem preposterous. The more you play, the more you will see that there?s more inside a word than you might expect!